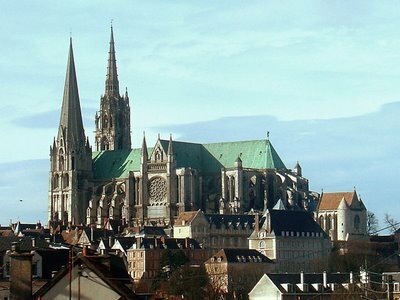 Southwest of Paris, in Chartres is the Latin Rite Catholic Cathedral of Our Lady of Chartres. The site has been used since the 4th sentury, but the present construction was built between 1193 and 1250. The cathedral itself is preserved in an extraordinary way, setting it aside from most other historic buildings of similar age. One of the famous relics inside, Sancta Camisa, said to have been worn by Virgin Mary at the birth of Christ, attracts lots of Christian pilgrims. It is also an UNESCO World Heritage Site, attracting even more tourists, making the old Cathedral a very popular destination. Built as the entrance for the 1889 World's Fair, the Eiffel Tower was the tallest man-made structure in the world for 41 years. 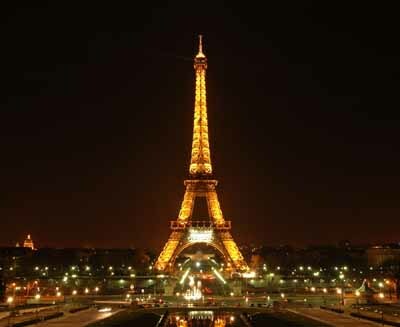 It now is a symbol of Paris and France. It is famous for it's design and is a popular tourist attraction. It is open to the public and features resturants at several floors. The second largest public park in Paris, also known as Luxembourg Gardens, and one of the sites that make the city such a romantic place to visit. It was built by Marie de Medicis in the beginning of the 17th century around Luxembourg Palace, modeled after the Boboli Gardens in Florence. It has been expanded several times, but some of the park has also been lost to the expanding city. Today the park size is about 22,5 hectares. It is centered around a large basin of water where children sail model boats. It has large lawns and gravel roads in parterre style. Around the park there are hundreds of statues and monuments. 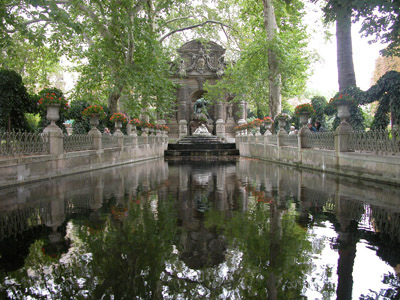 One of the more famous sites is the Medici Fountain. It was originally built as a nympheum. The original statues in the fountain have been replaced by the lovers Acis and Galatea as they are caught by the giant Polyphemus. Aside from being a historical monument, the Louvre Museum is the most visited art museum in the world with more then 8 million guests a year. It is also one of the largest museums in the world. 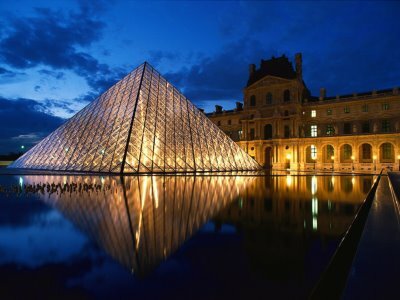 Originally it was built as an additional fortress to the Louvre Palace. Remnants of the fortress can still be found in the museum's basement. The museum was first opened in 1793, and has since then gathered an amazing collection of arts from all over the world. Mont Saint-Michel is a tidal island in Normandy. It lies about one kilometre off the French coast. There used to be a natural bridge crossing to the island during low tide, which was submerged during the high tide. The natural bridge was reinforced to a causeway in 1879. The history of the island, though, dates back to the 6 and 7 century, when it served as an Armorican stronghold. 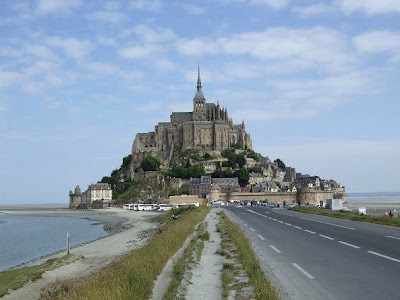 The island got it's name during the 8 century, after Archangel Michael supposedly commanded the bishop of Avranches, St. Aubert, to build a church there. Since then it has been an important strategical location during several battles. For instance, it played an important role in the Normandie invation of England. It was declared a historic monument in 1874. Along with the surrounding bay area, it was also listed as an UNESCO World Heritage Site in 1979. The Basilica of the Sacred Heart of Paris is a popular landmark in Paris, dedicated to the Secred Heart of Jesus. 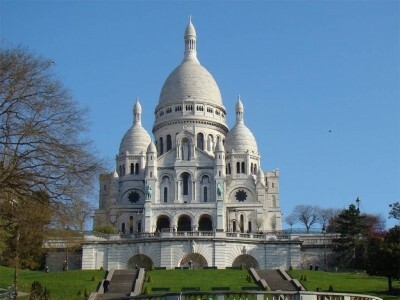 It is located on the summit of Montmartre, the talles hill in the city, giving it a fantastic wiev. It's construction was completed in 1914, but it was not consecrated until 1919, after World War I. The designer was Paul Abadie. It is built out of travertine stone, which constantly exudes calcite. This keeps the basilica white at all times.